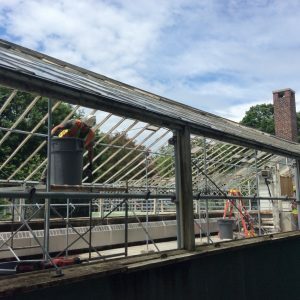 Long before we were able to bring the new greenhouses to the Museum, the old greenhouses had to be removed. Carefully, removing the remaining glass to avoid injury was a challenge. 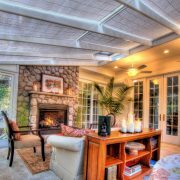 The competent crew of Conservatory Craftsmen got the job done without a scratch. Dumpsters were filled for recycling the wood products and glass. Metal parts were carefully removed and cataloged. Measurements were confirmed again, and numbers were sent to the shop. As window frames were produced, glass measurements were taken and tempered, safety glass, was put into production. Each opening had a location ID and a dimension of its own. The roof glass became quite a matter of discussion. In the ‘old days’ greenhouse glass was lapped, like fish scales. Since large sheets of glass were unavailable, small pieces that lapped over each other fit the need. So, we had to come up with an efficient glass, that was strong and safe and could lap. We designed a glass panel using 1/8″ tempered sandwiching two pieces of glass together over special lamination. 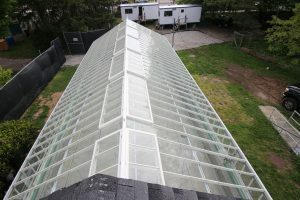 This effectively made the glass in the roofs of the greenhouses stronger than the glass on the windshield of your car. 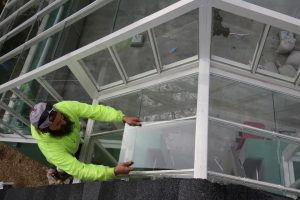 The installation of the glass, the step we call glazing was a blast from the past. 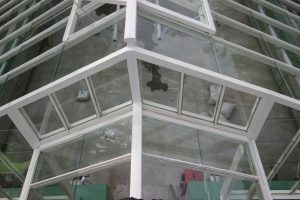 We installed glazing putty (pretty much not used in glazing in 50 years) to set the glass. Then we used special, stainless steel brads with a unique tool to hold the glass in place. Finally, we used a specially formulated silicone to seal the glass from the exterior. Each step took a glazier about half an hour and there are 400 pieces of glass on each roof! Roof vents were carefully designed to open with the gearing but close tight to seal and drain away water. In today’s world, that would be a simple matter with rubber seals. 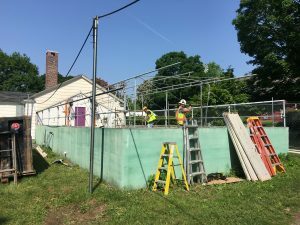 For historical purpose there are no gaskets of any kind on this project, each piece of the greenhouse had to be carefully fit to make sure water did not enter the greenhouse and it drained away from the greenhouse. 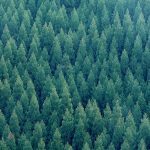 The project was also featured on Accoya.com, Click Here to read more.